More than 94,000 trees have roots on city-owned land in Phoenix, from the iconic towering palms of Encanto Park to native mesquite and paloverdes that line many street medians and rights-of-way. While still massive, this urban forest under city stewardship is steadily shrinking. Almost 1,000 trees are lost every year to the powerful gusts of monsoon storms or accidents. The city used to replace them, but it nearly eliminated funding for tree replacement during the recession. Some residents and civic groups say the loss of trees in public spaces has become apparent after years of budget cuts. And the city recently agreed to spend more money on trees. Public demand for trees was palpable at the city’s budget hearings this spring, when residents spoke out about the need for shade. Aside from police officers and increased library hours, trees were among the most-repeated spending requests. Aimee Williamson is among the residents who asked city leaders to pay more attention to trees. Williamson heads a new non-profit group, Trees Matter, which focuses on growing the Valley’s tree canopy. The group was born out of the Valley Permaculture Alliance, Williamson said, after they realized a lack of awareness about the benefits of trees. She said trees are a long-term investment for a desert city like Phoenix as temperatures rise and air quality remains a concern — two consequences of urbanization that trees help combat. Those calls for City Hall to reinvest in the city’s urban forest aren’t unnoticed. Phoenix plans to spend about $492,000 in its next budget to maintain trees and replace those that are damaged beyond repair. The money comes from state funding for road projects and the city’s special sales tax for parks. City Manager Ed Zuercher said shade and temperature are issues the city must address tobe economically successful over time, so the city remains a place people want to be. Zuercher said Phoenix could adopt rules to ensure commercial property owners do their part. One option: Inspect properties to see if they actually have the number of trees outlined in their site plans approved by the city — and that they replace dead ones. Before that could be considered, Zuercher said, the city should at least start replacing its own trees lost each year. The funding hike in the next budget, which takes effect July 1, is a start. And the city needs to redouble its efforts if it hopes to meet its goal to grow the city’s shade canopy. 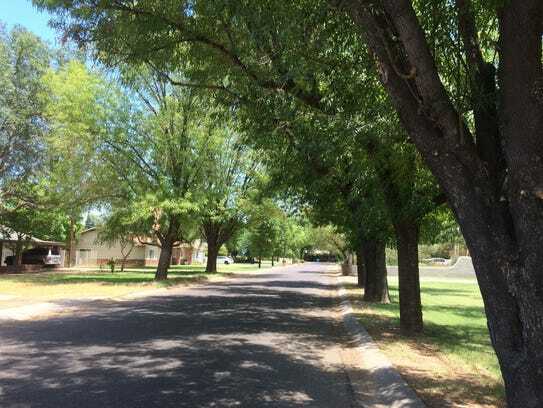 In 2010, the City Council approved a Tree and Shade Master Plan that calls for Phoenix to increase the tree shade canopy to 25 percent by 2030. Currently, the city’s shade canopy is about 12 percent. Richard Adkins oversees that plan as the city’s forestry supervisor. He said after several bad years, the city is starting to reverse the trend and repair its shade canopy. Adkins said most of the trees Phoenix lost were in street medians or rights-of-way, areas where traffic makes pruning difficult and the environment is harsher for them. Phoenix was also hit particularly hard in summer 2014, when monsoon storms uprooted countless trees. Residents in the city’s urban core have been extra vocal about funding for tree planting. The area is undergoing a construction boom and dozens of new apartment buildings have risen, but there are few green spaces to match the growth. Sean Sweat, president of the Urban Phoenix Project, a downtown advocacy group, said trees and small parks are essential to making dense urban spaces livable, especially in a hot climate. For starters, Sweat said, the city needs to mitigate the urban heat-island effect. Areas with dense human activity and development often are warmer than surrounding rural areas. Adkins said a common concern about planting more trees in Phoenix is that they waste water. However, he said, that concern can be negated if desert-friendly varieties are planted and people don’t over-water. Plus, trees help prevent evaporation by providing shade and help store water in the ground. He said Phoenix was once known as the “Valley of gardens and trees.” Postcards and photos from the first half of the 20th century show lush tree-lined streets and canal banks lined with tall cottonwood trees and grasses. Adkins said the city’s mentality changed around the 1950s. Air-conditioning become common in most households, streets got wider and people stopped caring about trees as much. Jim McPherson, who lives in midtown, began chronicling the city’s lost trees on Earth Day 2014. He started a Facebook photo album called “A Tree Used to Grow in Phoenix” and posted hundreds of pictures of tree stumps and empty tree wells lining city sidewalks. McPherson said he’s noticed the city and other groups have started to replace lost trees in recent years. Beyond the environmental benefits, he said, trees help Phoenix create a sense of place. And the storms continue to damage trees, houses and cars etc. lots of damage across the valley resulting in downed trees and branches needing to be removed. This branch fell about 100 feet from a neighbors eucalyptus tree damaging the patio breaking thru the roof and breaking several trusses causing severe damage to the house. Eucalyptus trees are a beautiful tree that grow fast and very big. Euc’s wood is brittle and prone to shedding its branches as stated in the article from anbg.gov.au, As the common name implies, the wood is very brittle and is not considered useful for timber. All eucalypts have an efficient method for shedding limbs, as described by Jacobs (1955). For this reason, larger species such as E. mannifera should not be planted so that they will overhang dwellings. However, its graceful form and branching habit do make it an excellent shade or specimen tree. They are prone to breaking off branches like this when the wind picks up. This tree is a hazard to the immediate area as its branches reach into 4 separate backyards. This tree dropped 2 large and several smaller branches in the storm. We climbed and removed several broken and hanging branches, these branches were already broken off and were suspended by other branches, just hanging there ready to fall. This is a common tree for the valley, but this tree out grew its usefulness and grew into a Hazard for the residents in the four houses that surround this tree as it grew to a height of 80 feet and a diameter of 45 inches. Over the years this tree has shed many branches, some large and all are dangerous, so the owners chose to have it removed as they realized that it had turned into the wrong tree for their backyard. Proper tree maintenance and tree trimming is important to preventing emergency tree damage. 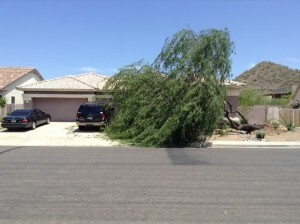 During Monsoon storms it is the wind that causes the most storm damage to trees, often resulting in property damage in Arizona. Keeping your trees trimmed properly can prevent a fallen tree from happening in the first place. 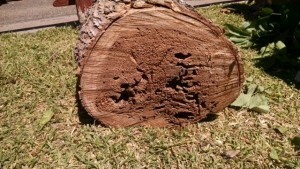 Let us assess your trees for problems and weaknesses that can be taken care of before the damage happens. Don’t wait until the storm uproots your valuable trees that took many years to grow. Tree pruning is also beneficial to ensure your trees do not have hanging or dead limbs that pose a threat to your property. Even for a tree that is otherwise perfectly healthy, overly dense foliage poses a safety hazard during stormy weather. A dense canopy will not allow the wind to easily pass through and the resistance to wind can and will cause branches to break during a major wind/monsoon storm. Too dense of canopy can even bring the entire tree down. Dead wood is unpredictable because it is brittle, and cannot give under pressure like living tree branches. Cracks are clear indicators of potential branch failure, where there will be splitting sooner or later. Poor tree composition (branch structure) is harder for the layman to identify. Look for excessive leaning, long horizontal limbs, crossing branches that rub against each other and create wounds, and narrow crotches (V-shaped instead of U-shaped). Multi-trunked trees need special attention and care. Two trunks or leaders that are of identical diameter and have a narrow crotch are not a good sign. To prevent splitting, choose one to be made dominant by stunting the growth of the other through pruning (called subordination). Decay, as evidenced by fungal growth or hollow cavities, is a sign of weakness. 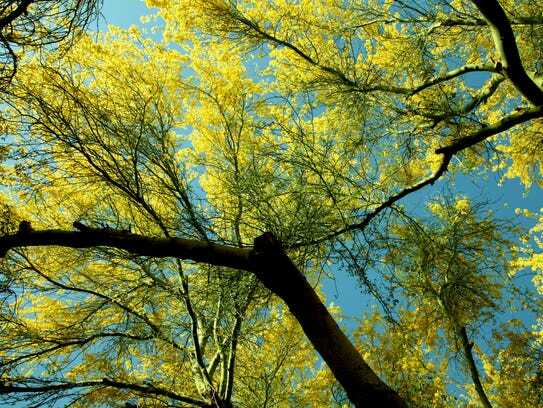 Pests, such as the Palo Verde borer, can exacerbate a tree’s health problems, but they typically target trees that are already sickly. Root problems, such as stem-girdling roots, while sometimes harder to detect, have the most impact on a tree’s inability to stay upright. Keep in mind that roots are a tree’s anchor. If a significant portion of a mature tree’s roots have been crushed or cut or if the tree is still root-bound from the box it came in from the nursery before it was planted, you may consider removing the tree before Mother Nature removes it for you (without warning). Weak roots and a thick canopy is the deadliest combination during a storm. Plant new trees with their mature size in mind. Do not plant in shallow soils, too close to buildings or wires, or in steep banks. Some trees are more brittle and susceptible to breaking. Water, mulch, and fertilize the trees regularly and properly. Prune annually (or every two to three years, depending on the variety) even while the trees are still young. Proper pruning is your best bet for avoiding problems. Avoid excavating around roots. If some excavation is necessary, take measures to minimize cutting or any other impairment of the roots. Do not top trees! This common but incorrect practice guarantees eventual failure of branches. Desert trees, palo verde and mesquite trees are very common in residential neighborhoods and have tendency to be over grown with large canopies that grow quickly due to the abundance of water available to them. These desert plants are drought tolerant and need very little watering to survive, so when they have water available trough drip systems or irrigation they thrive and grow fast and large which can be very desirable trees. 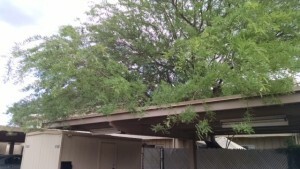 the down side is the canopy can out grow the root structure and create an unstable situation that during high winds and monsoon storms can blow them over as this large Mesquite tree was blown over in a monsoon storm in 2015 in Mesa Arizona. This particular tree roots were intertwined and were wrapped around each other from being kept to long in its original planting bucket that you would buy it from Home Depot or Lowes. This situation is called root bound. You can see how the roots have grown into a circular pattern and did not grow outward which this large tree needed for support during windy conditions. This tree was fed by several drip systems providing it with much more water than it needed to grow healthy, consequently it took all the water it could get and grew very large, outgrowing its root structure which was already weakened by its root bound situation. 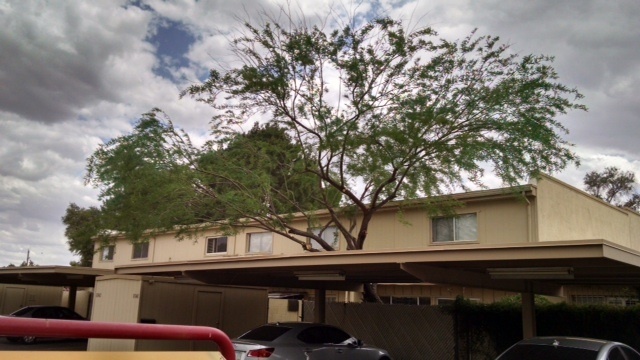 Ash trees have been very common trees in the Phoenix area for many years as they are a hearty medium sized tree that grows into a nice full canopy. There are many varieties and these that we are removing here are over 50 years old and have succumbed to the ravages of wood peckers, wood carver bees and carpenter ants. These trees have become very structurally compromised and pose a hazard to the people and pets that walk near them. Many branches have fallen to the ground over the years, these branches have been weakened and are rotting from the insects and wood rot and disease they introduce. New Heights Tree Service has the expertise, skilled climbers, bucket trucks to handle any kind of tree removal, tree trimming, tree health assessment that you need. Trees are a valuable asset to your property and deserve to be treated by professionals that make tree health their business and life. 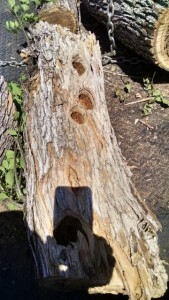 We had the opportunity to trim this very old Mesquite tree in Scottsdale Saturday. It was very full and had many branches that were over growing each other and one of the main leaders was up against the carport aw ning and bending the metal structure. We were going to remove this leader or branch but after further inspecting this branch was one half of the tree, so instead we reduced the weight so it would not impact the awning with as much force. tree trimming or pruning of this wonderful tree will give it a very good chance of surviving the up and coming monsoon season. 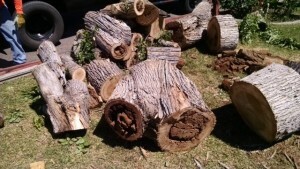 Here are some pictures from some Ash trees that we removed. The needed tree removal for awhile now, they are over 50 years old and the wood peckers and wood carver bees severally damaged the trees which allowed termites and ants to attack the weakened condition of these once beautiful Ash trees. 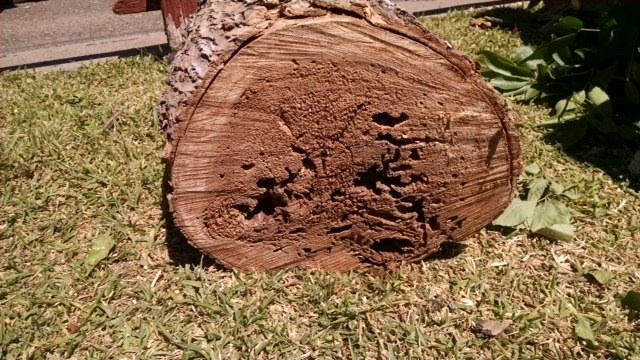 Herbicides, weed killers used in the lawn area also poorly affected the health of these trees. Proper care with fertilization could have saved these trees from this destruction. Aleppo pine trees grow very well in our desert climate with a good water source and fertile soil. They do very well with proper feeding also. Consequently they can out grow the area where they were planted and begin to cause problems with roots lifting sidewalks, branches invading public areas and walkways and becoming a hazard. So that was the case today with a very mature pine tree that has become a hazard to the surrounding area, structures and people. So the best and safest option was for a tree removal, stump grind and replanting of some shrubs. ©2015 New Heights Tree Service, all rights reserved.